Okay, folks. It's August. We are deep in the throes of the dog days of summer, but the end is getting closer. The other day, I saw a few leaves that were a rusty brown, standing out against the green of the trees surrounding them. And the day after tomorrow, school starts. My boss retired yesterday. I'd only worked under her directly for a few months, and we worked hard and closely to make sure I got all the training she could impart, but the nature of our work meant that plans and schedules changed fast and often, and we didn't always have a chance to work together. She was phenomenal--and now she's gone. While I always want to be present and supportive to my team, I feel like it's very important in the weeks ahead for me to lean into those responsibilities, since my boss's replacement is not yet in place. And there's so much work to do! When it rains, it pours. And right at the same time that my Main Hustle is experiencing big changes and opportunities, my side hustles of caregiving and instructing a graduate-level class are starting back up again. I'm not sure I will be able to teach again after this fall...while I am by no means long in the tooth, I am getting to a point where I need to be willing to pause and assess and focus on what's most important. But in the meantime, I'm organizing and reviewing my notes, reading pedagogical articles and books, and maaaaaaaaybe indulging in a little bot of back-to-school supply shopping. But no lie, my schedule is going to be very demanding this fall, and I've only got a couple more weeks before that schedule starts. Since there's so much going on in my work life, and so many demands on my time, I know I need to be vigilant in self-care and boundaries. This means trying to be mindful about some things, like setting alarms to remind me to drink water, and saying no to other things, like extra social plans when there are too many other things still to tend to. It means forcing myself to do things that I don't wanna do, like the dreaded exercise thing, and not cancelling counseling appointments, and eating things that maybe have at least some pretentions to nutrition. If I am not taking care of myself, I'm not going to be able to take care of others. There is some fun stuff coming up this month, though. 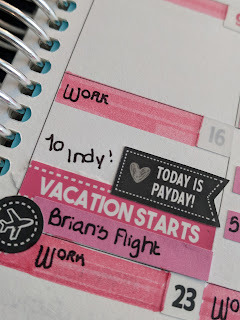 My North Star, Brian, is flying for a long weekend just before classes start, and we're going to have an action-packed weekend up in Indy. There's a Smashing Pumpkins concert, and a day at the State Fair (I think this is becoming an annual tradition), and another day meandering around rural Southern Indiana, and maybe something special will be happening to my tattoo. 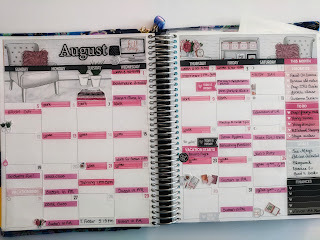 So, that's an overview of the the big stuff happening in my life this August. There are a lot of smaller goals and ideas that I want to tackle--getting drapes hung in my apartment, and making some meals to freeze, and getting my car detailed, and reading some books, but those are the details that will eventually, hopefully fill in the big picture. We'll see how that picture looks at the end of this month.